The expanded second-floor workout room in the Lopes Performance Center features ceiling-to-floor windows. 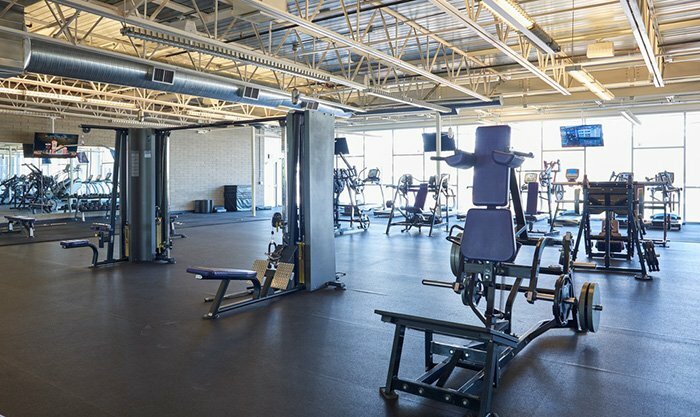 At a University that aims to expand the limits of students and staffers, Grand Canyon University did the same for its main campus recreation facility. 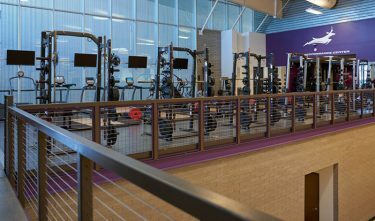 The two-story Lopes Performance Center underwent a transformation this academic year in order to be a bigger, brighter place for GCU students and staffers to strengthen their bodies in between strengthening their minds. Students and staff now have full-time access to the second-floor weight room. The LPC’s second-floor student fitness room was expanded by 29 percent to become a 7,000-square foot room. A north glass wall brightens the room’s open space, where 12 additional pieces of workout equipment joined the existing array of treadmills, elliptical machines, spin bikes, weightlifting racks, a CrossFit station, a StairMaster, rowing machines and more. The LPC second-floor weight room, which is 4,000 square feet, is now a dedicated space for students and staff. 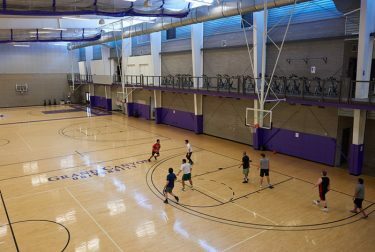 And the 2017 opening of the GCU Basketball Practice Facility for the men’s and women’s basketball teams also expanded availability for the building’s three basketball/volleyball courts. The LPC is like a classroom for junior Brittany Pearson, who is majoring in exercise science with an emphasis in sports performance. She now works out at the LPC four or five times per week after going to various gyms for workouts during the 2016-17 academic year. As students return to campus this month, the LPC and other student fitness centers at Chaparral, Juniper and Papago will be open from 6 a.m. to midnight on weekdays and 8 a.m. to midnight on weekends. Director of Recreation Matt Lamb said a more efficient check-in system, through a phone app, will be coming to the LPC. Even without updated data, it is clear that student use has increased beyond the estimate of 2,200 LPC visitors per week during the 2016-17 academic year. The new Basketball Practice Facility has opened the Lopes Performance Center courts to everyone on campus. The space has given more breathing room for the LPC’s boot camps, which are offered for free to students and staffers. The increased court space and weight room availability has allowed Intramural Sports to increase participation and is just in time for the massive growth of Club Sports, which will be housed in a new campus building in the future. Campus Recreation will research fitness trends to examine what additional classes or equipment it will offer in the future. The LPC expansion already is keeping more students like sophomore Brandon Biggers on campus for workouts. Biggers, a business marketing major, trains six days a week and has returned to the LPC partly because of its increased space. “I think it looks great,” Biggers said. “I like that they knocked down the wall and made it glass so you can have a view when you’re running or on an elliptical. They did a good job. Contact Paul Coro at (602) 639-8641 or paul.coro@gcu.edu.